Robert Reid (1862-1929) was an American painter and muralist. Born in Stockbridge, Massachusetts, Reid studied at the School of the Museum of Fine Arts in Boston and at the Art Students League in New York. Reid was considered a decorative painter and found success in stained glass and mural commissions, such as at the World's Fair in Chicago in 1893 and in several government buildings. Reid was also an accomplished portraitist and produced several paintings of women among flowers, such as this one. Fleur de Lis is a beautiful piece with vibrant color and a compelling composition. 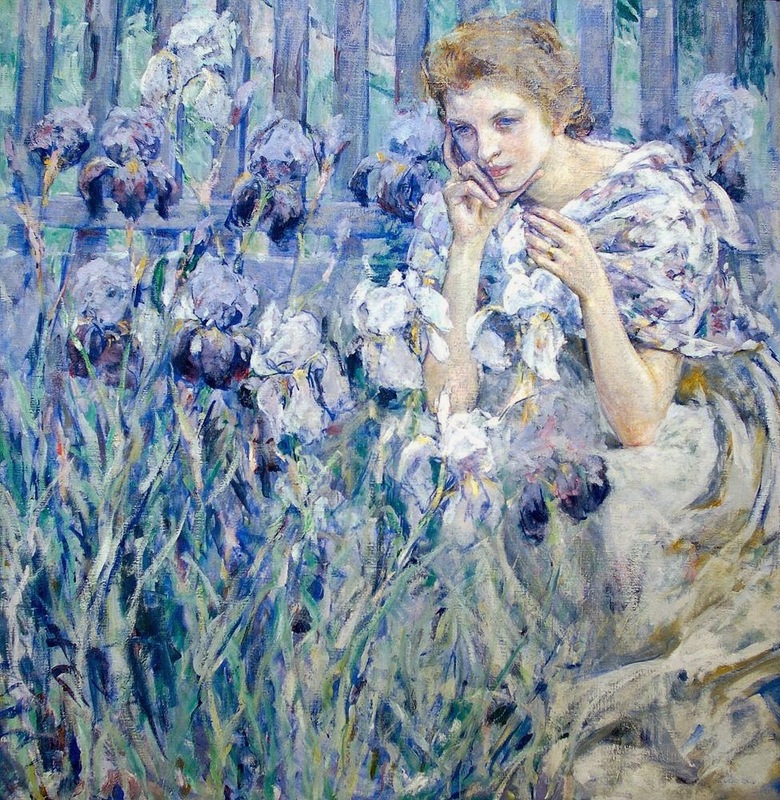 The subject seems to become one of the flowers, as her shawl has the same palette of purple and white. However this painting is not a simple bucolic scene in a flower patch; there is also a tension to this woman. She has a rather intense expression as she gazes toward, or possibly past, these irises. She looks rather sad, perhaps wistful, or maybe merely contemplative, but there is great energy in her face. Her hands also suggest that she is not relaxed in the scene. Her right hand, which rises like the flowers, holds her face in spread fingers but the pose does not seem natural to her; meanwhile her left hand is raised in the air, its purpose unfulfilled. Is she eager to finish the sitting and leave these flowers? Perhaps she is itching to reach out and pick one. We cannot know what is happening behind those vivid blue eyes, but thanks to the subject's intensity, and the beauty of the scene, the painting is continually engaging.